Police Week 2017 continued this Saturday across the country where the force was joined by thousands of residents and local leaders in community sanitation activities as well as construction of clean water sources and renovating houses. In Nyaruguru and Rutsiro districts, Police started the construction of 72 toilets for the disadvantaged households – 36 in each of the two districts. At least 38 toilets were constructed that day. Also in Nyaruguru, Police officially handed over solar power systems to 107 households, constructed roads that link communities in Nkomero Village of Mwoya Cell in Nyagisozi Sector, and renovated a house of one of the residents. The Minister of State in charge of Primary and Secondary in the Ministry of Education, Isaac Munyakazi, while addressing residents of Nyagisozi shortly after the community activities, urged them to actively engage and stay focused in development programmes. “The government will continue to support you to further improve your wellbeing, but you also need to utilize and protect what you have been given,” the State Minister told residents. He also reminded them of their role in sustaining security by being an eye for each other and working with security organs by providing them with information on any illegal or criminal activities they suspect or witness. The Deputy Inspector General of Police (DIGP) in charge of Administration and Personnel, Juvenal Marizamunda, commended the role Rwandans play in the implementation and success of community policing initiatives. “It’s the journey to sustainable security that we are still into together especially through compliance with the law and real time information on law breakers,” DIGP Marizamunda said. 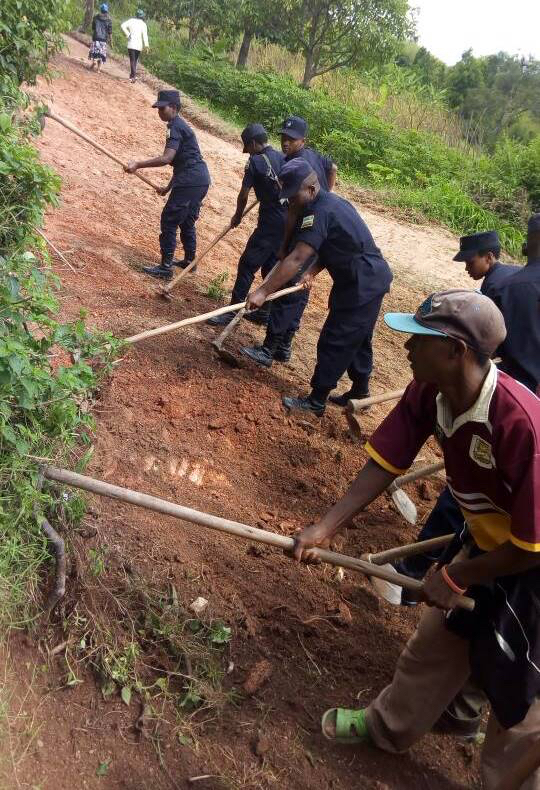 Meanwhile, in Rutsiro the Police Week activities also included the handover of solar energy systems to 115 households and digging about 400 metres of water channel to a site where a clean water sources that will serve nearly 450 residents in Busuku Cell, will be constructed. The Minister of State in charge of Socio-Economic Development in the Ministry of Local Government, Vincent Munyeshyaka, while speaking in Rutsiro, said that modern policing is not only defined by police operations but also police activities to develop communities and prevent what could cause crime like poverty. Elsewhere in Burera District, the Governor of the Northern Province, Jean Claude Musabyimana and the Regional Police Commander, Assistant Commissioner of Police (ACP) Bertin Mutezintare as well as police officers in the region, joined residents of Rutovu in Kinyababa Sector to inaugurate a water source constructed in Nyabizi II Village. They also constructed a 2km water channel to a site in Rutovu and to Nyabizi Primary School where other clean water sources will be constructed. Similar activities were also held in Gasabo District and other parts of the country.